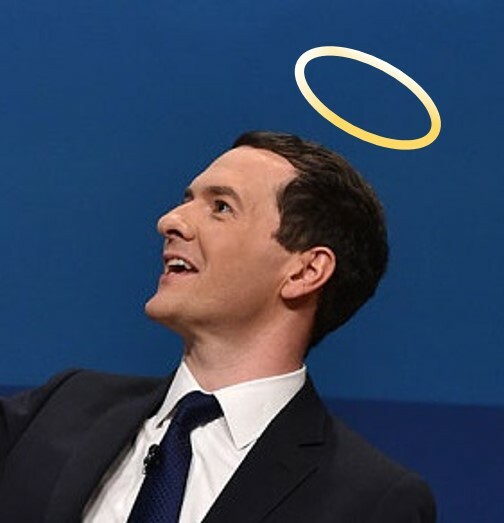 What a time to be George Osborne! Master of all he surveys! Well, there will always be Events - Scotty and euro-type events, most likely - but in the meantime, full steam ahead into waters of his own choosing. No surprise that Mandelson chooses to befriend him (as we are told): Mandy knows a political do-er (or must we say builder?) when he sees one. Osborne, in return, doubtless values input from one with so fine a grasp of how to use the levers of power creatively. So says the Grauniad's Rafeal Behr and it seems about right. Theresa May be hot on his heels. No? Every time I listen to him I am reminded of Warren Buffett's line - Only when the tide goes out do you discover who's been swimming naked. "Property owning democracy" means - The banks are still f*cked and we need to pimp more mortgages and boost house prices again. "Public Sector pension funds investing in infrastructure" - The banks are still f*cked. The Treasury is f*cked. They are the only people with cash so lets see if we can twist a few arms to get at it. That and the fact that we are being invaded by countless pushy young blokes and there is nothing can be done to stop it. So what if we build a million new homes or create a million new jobs ? The Tory Party will be loathed in 4 years - by the people stupid enough to vote for them. I dont have to outrun than the bear Kevin, just you; the political mantra of two party politics. Not seen or heard will stop me voting UKIP at every opportunity. Writing in The Telegraph, Dan Hodges describes David Cameron as "the new leader of the British Left" and it's hard to disagree. For purely tactical reasons, the Conservative Party has redefined itself as the SDP in all but name. It's become the party of technocratic interventionist Big Government because that's where it thinks the political centre of gravity lies (in every sense of the word). The fundamental lesson is that the Conservative Party has been so successful at winning elections because it is not an ideological "conservative" party. It was founded at a time when small-c conservatism was the mainstream British attitude. It expressed the common attitudes of the time and called it a philosophy. In 1945 the party was blind-sided by a sudden demand for radical change arising out of the experiences of World War II – the working class had given everything to win WWI and got nothing from the peace except a return to "Upstairs, Downstairs" and they weren't going to be fooled again. But within a few years the party had accepted nationalisation and Big Government as the new normal and they were willing to give the people whatever they wanted. It might seem that there was a radical change in 1979. But in reality public opinion had already turned against the "Post-War Consensus" at that point. Labour couldn't offer the change that the public wanted because it was tied to trade union vested interests, but the chameleonic Tories could. For a few years they became ideological free-market enthusiasts because that's what the times demanded but as soon as that moment passed the party cast off Thatcherism like a snake shedding an old skin. Once again, it expressed the common attitudes of the time and called it a philosophy. David Cameron has continued this tradition in his "hug a husky" green phase, the subsequent downplaying of the same, and his current Social Justice Warrior phase. There's an old joke that tabloid journalism consists of recognising which way public opinion is moving then running round to the front and shouting "Follow Me!". Well, that's also the key to understanding the Conservative Party and why it keeps winning elections. the trouble is that it is also borrowing from the midiocy of Richard Myphy in its proposa;ls to allow local authorities to invest pension fund money in infrastructure!¬ I hope to Christ that no local authority pension fund is so imbecilic as to invest in roads etc...it can only end in impoverished old folks. Mrs Brady, old lady. Still, it’s certainly worth reflecting on just how much British politics has changed. The Conservatives have become the SDP. Labour has turned into RESPECT. UKIP are the new Conservatives. The whole of British politics has suddenly shifted ten points to the left ideologically and twenty points to the right in terms of party allegiance and the LibDems have been crushed between the shifting tectonic plates. Interesting times, and you know what that means. Andrew - The London Evening Standard now reads like The Guardian - ditto a couple of the Tory broadsheets. CU - Osborne will have a bear behind, when he is bequeathed a chalice as poisonous as the one handed to Gordon Brown.